In class, there are some words and phrases that'll we'll use every day. You may want to ask your teacher for permission or for important information. 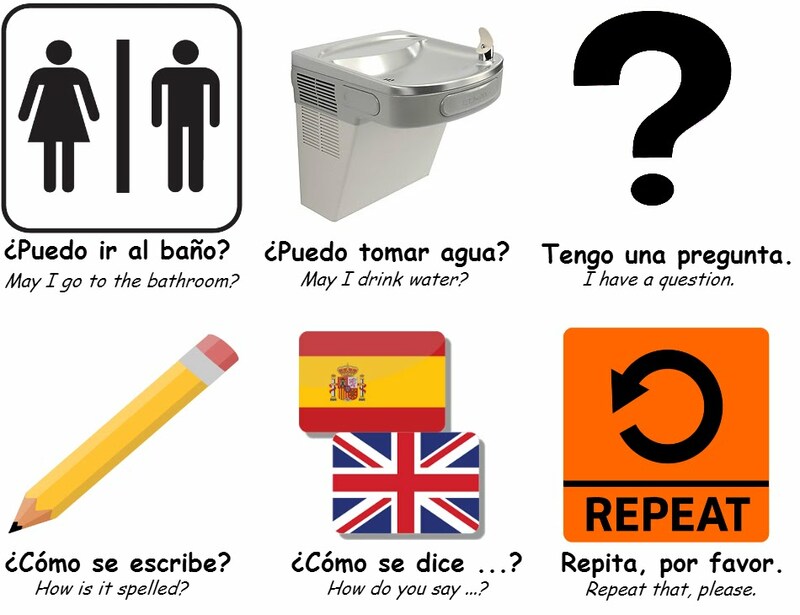 Asking to go use the bathroom or get a drink of water use the word puedo, which means I can, or in a question, can I?. Can we work together? ¿Podemos trabajar juntos? How do you say ...? ¿Cómo se dice? I have a question. Tengo una pregunta. I need a paper. Necesito un papel. I need a pencil. Necesito un lápiz. I need help. Necesito ayuda. Is there homework? ¿Hay tarea? May I go to the bathroom? ¿Puedo ir al baño? May I go drink water? ¿Puedo ir a tomar agua? Please repeat that. Repita, por favor. When is the quiz? ¿Cuándo es la prueba?